Does your business really need to be reviewed locally? Yes! If you want to increase your visibility to local shoppers on the search engines, engaging with Google+ is essential. Customer reviews can do much to keep your brand in the minds of local shoppers. Reviews on Google are now an essential marketing tool that every savvy small business owner needs to know about. Studies show that positive reviews convert undecided shoppers into paying customers. 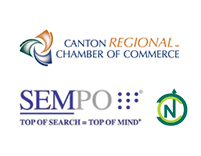 In fact, reviews on Google may be more influential in North Canton customer conversion than any other aspect of website optimization. If you want local shoppers to click through and buy, Sanctuary Internet Marketing Company can help to make it happen. That’s right. Just ask everyone who purchases your product or hires your service to write a review outlining their experience with your company. The key word here is ask. Never, ever pay for reviews. Besides being unethical, doing so may get your business banned from Google. Everyone likes to get a gold star in recognition of their good work. When local shoppers are ‘just browsing’ on Google+, they’re also seeing ratings. If your local biz has many positive reviews, people will trust you more than a local business that has few or none. 3. Be a friendly business owner from day one. Enormous corporations have endless marketing budgets. Your enterprise may need to be more friendly with the locals. If you’re a small boutique, local bakery or other customer-friendly local business, consider placing an old-fashioned clipboard and pencil so visitors can give you their contact info. If they make a purchase, contact them with a pleasant letter of thanks. If you send an email, provide a link to a review site. Be involved with Facebook, Twitter and other online gathering places. Make pages or hire a skilled social marketing expert to create them for you. Don’t post so much that you irk potential customers. There is a fine line between overdoing it and doing it well, as far as social marketing is concerned. Not sure how to step into the world of social media? Speak with someone here at Sanctuary Internet Marketing. 5. Be a great business. Provide first-class customer service and treat everyone who walks through your door as a friend. Respond to customer suggestions. Adopt a the-customer’s-always-right attitude. Be a great biz and people will tell their friends about you. Word-of-mouth reviews are almost as valuable as glowing reviews posted on Google+. There is a lot to know about encouraging good reviews on Google+. Allow Sanctuary Internet Marketing to manage the gathering and promotion of your positive reviews. Contact us today for a no-cost upfront marketing consultation. We can take a look at your whole internet presence and tell you what’s working and what’s not. ← Why is Responsive Website Design Important?